For more than 40 years, Ocean Alliance has studied a population of right whales that uses the bays of Península Valdés as a nursery ground–working closely for the past 14 years with our sister organization, Instituto de Conservación de Ballenas (ICB), in Argentina. It is the longest continuous study of any great whale based on known individuals. The study began in 1970 when Ocean Alliance president Dr. Roger Payne discovered that individual right whales could be told apart by the differing patterns of white markings (callosities) on their heads. He realized that by following the lives of individuals, one could learn far more about the whales than was being learned from dead whales by scientists who worked with the whaling industry. Right whales are the most endangered of the great whales. So tirelessly did whalers hunt them that even after 60 years of protection they are rarely seen in the North Pacific where they were once abundant. The tiny, remnant population of less than 400 right whales in the North Atlantic recently suffered a year without calves which raised concern that this population might be going extinct. This species was called the right whale because for centuries it was the “right whale to kill.” It swam slowly, its thick blubber caused it to float when dead, and its baleen was worth a fortune. We have learned that right whales do not cross the equator, so we now know that the Southern hemisphere population is a separate species. Its population is larger than the northern populations, but even though the Southern hemisphere populations number in the thousands, they are far below pre-exploitation levels. The Southern Right Whale Program is now directed in the U.S. by Dr. Victoria Rowntree, and in Argentina by Dr. Mariano Sironi of ICB. Today, many of the animals Dr. Payne identified in 1970 still return to the Peninsula, but now their new calves are accompanied by the calves of their daughters, granddaughters and great-granddaughters. The value of such a long-term study increases exponentially as each new year of data gets added to it. 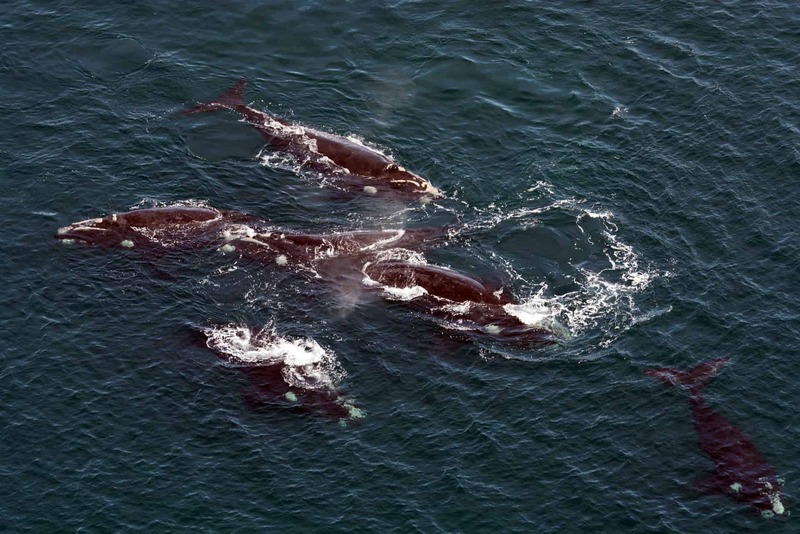 Ocean Alliance now follows the lives of more than 2,600 known individual right whales. Through annual surveys and focused investigations, Ocean Alliance has created a detailed picture of right whale biology and an invaluable record of the population’s growth, distribution and habitat preferences. The techniques that Ocean Alliance pioneered are now used to study endangered whale species throughout the world. The long-term objective of the Southern Right Whale Program is to promote the recovery of right whales on a worldwide basis through research, conservation and education. Right whales occupy a large portion of the world’s oceans. If we protect right whales, the animals that share their habitat will also be protected. The population of southern right whales that we study off Argentina is threatened by habitat destruction. We continue to improve our understanding of right whales, and those findings are incorporated into right whale protection plans in Argentina as well as globally. The (right whale) data [Ocean Alliance] hold would no doubt be the single most valuable source of information on whales and their environment available… there really is nothing else out there quite as good.